The E-Type is one of Jaguar's most popular cars. It is well-known for being stunning in appearance and features. The engineers made this car to be more masculine in appearance. Jaguar E-Type was designed with a short tail and a long nose, making the driver seat be located farther back in the car. The car has small doors and a stretched out bump on the hood. The designers also put headlights far back and added a small grill on both sides. In the inside, the design is also stunning. There is leather everywhere and a slender, wooden steering wheel. The Jaguar E-Type is synonymous with responsive handling and great cornering. It has a top speed of approximately 150 miles per hour. 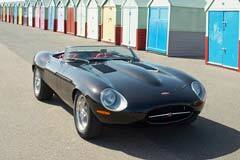 This vehicle was in production between 1961 and 1974 and is widely considered a beautiful collector’s car.